The Mountain of Moses – a place and a person most everyone one has heard of. A place that is debated among the so-called scholars of this world, rightly so, they do have a point. Nevertheless, through consciousness by using Kensiology muscle testing, Mount Sinai is where Moses got the Ten Commandments and the laws given to the Israelites, and where Moses interacted with the Divine Spirit, and the place the Divine Spirit spoke out of the fire to the Israelites, although they saw no form. There are some questions to be asked when visiting this area of Sinai, though. First there has to be a large enough area to fit at least 600,000 people with livestock, tents, wagons, food stuffs and whatever else. Considering that the Jewish Scribes manipulated the Hebrew Scriptures from the time of the Babylonian captivity until the second century BCE, the numbers and chronology is incorrect. Thus, considering that Egypt had a major slave labor work force, a person should understand that a large number of Israelites came out of Egypt with Moses. Trying to understand the travels of Moses and how many times he went up and down the mountain can be challenging. For an example, to follow Moses once they got to the mountain the order of events you would have to read in this order, Exodus chapters; 19, 24, 32, 34:1-28, 33:12-23, 34:29-35, 33:1-6. Then to continue on with the journey starts at Numbers 10:11 through Chapter 14 and so on. Exodus chapters 16-18 should be in numbers, because they stopped at the Oasis on the way to the mountain and got water, which is not to far away, and they also plundered the Egyptians and would have had plenty of food with them. Some major manipulation of Exodus did take place, although with a little direction and discernment, a person can figure out the correct order of events. The picture above is the camel trail everyone takes to climb the mountain. 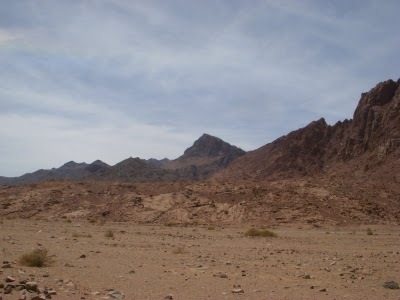 The above picture is take from the back-side which shows the summit of Mount Sinai. 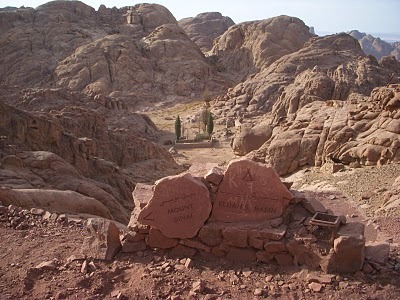 The below picture is of Elijah’s basin, a very secluded, quite area. I have thoroughly explored this area. There are two wadis in the area that a person can reach the mountain of Moses. I hiked up the Wadi Arbaein which comes out in between the Mountain of St Katherine and the Mountain of Sinai. This is the back side of the Mountain compared to where the Monastery of St Katherine is located. The mountain can be climbed from this area also, instead of going the route most people go, which is past the Monastery. At this point, in between both mountains, I turned left to go back walking through the Wadi Shrayj which brought me back to the Fox camp where I was staying, which is at the foot of the mountain area into this large valley, although not at the foot of Mount Sinai itself. 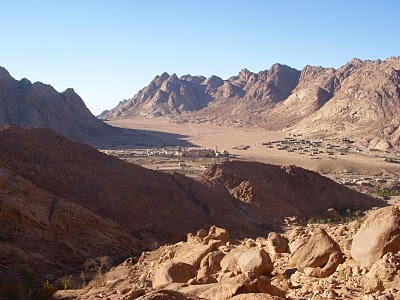 From the road that heads out of the valley where the Monastery is located, there is a large valley, large enough for at least 600,000 people to camp, although you cannot see Mount Sinai from this location, not even the Monastery. The question has to be asked where was the Divine glory observed by the Israelites? Which mountain were they looking at, for it was not Mount Sinai they were looking at. In Exodus it is explained that the Divine spoke out of the fire that was on the mountain, although they saw no form. Smoke descended on the mountain, thick fog, and fire. Also, it was said that nobody was suppose to approach the mountain, again this could not have been Mount Sinai that they were observing, which the lower pictures show – this is not Mount Sinai. The Mountain to the right is call Mount Safsafa. 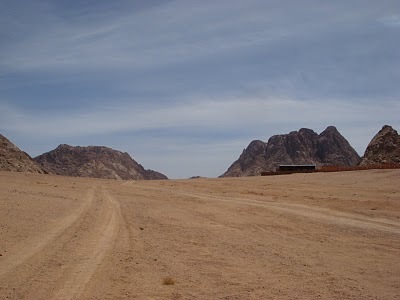 The Fox camp is located at the foot of Mount Safsafa. Getting a ride out to the back-end of this valley and viewing with clear eye Mountain Safsafa from a far distance, there can only be one conclusion. The Divine glory, which the Divine spirit spoke out of the fire was on this mountainous region which includes both mountains with the wadi going through the two – the whole mountainous region was filled with smoke and fire. 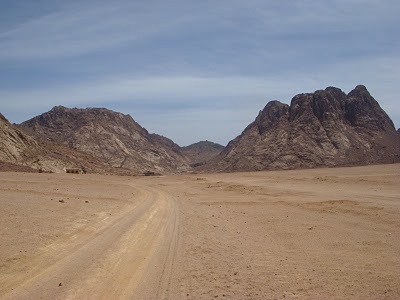 The above picture is from the very back of the valley – Wadi Raha – with Mount Safsafa in view. The above picture is a closer view although quite far away, Mount Safsafa is on the right. The below picture is the view you get being in the majority of the valley. Mount Safsafa is on the right. A spectacular site it must have been. So spectacular that many Israelites moved back from the front because they were fearful of the power of the Divine Spirit of the Light. Looking at the picture above, in the very back you see some trees, this is where the Monastery of St Katherine is located in the wadi. 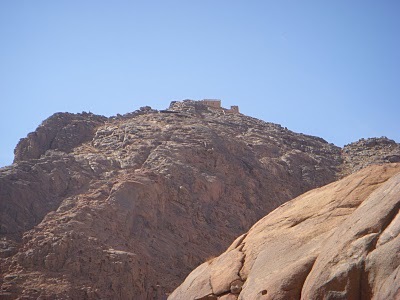 From the Monastery you cannot see the summit of Mount Sinai. Whatever the case may be, the Israelites camped in this valley, and the Divine showed his glory on this mountainous region in the above pictures. The Valley is called the Wadi Raha, which defines as – Stay. The valley which I viewed from the Wadi Shrayj in the below picture. Moses, who climbed Mount Sinai, which is easily climbable, was not within the eyes of the camp. Which makes sense considering the privacy nature of the Divine Spirit; a cause of solitude and privacy for Moses to interact with the Divine Spirit of the light. 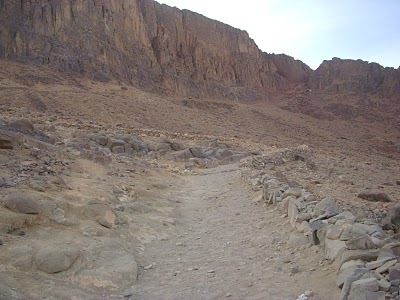 After getting the two tablets of the commandments, Moses might have taken the back way down and walk through the Wadi Shrayj, because he was able to view the whole camp giving worship to the golden caff, although coming down the way of the Monastery he could have seen the whole camp also. I took the back way down. Just from the way things happened that morning, hooking up with the Bedouin guys, I couldn’t of found the way down from the back way without their help. All the energy and how things took place told me that Moses took the back route to climb the mountain and to descend. 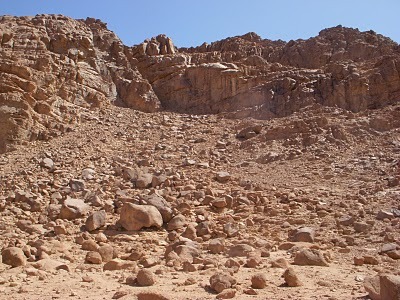 The below picture is the area I climbed down from to get to the Wadi Shrayj. After this climb the route into the basin is very secluded and quite. There is no way was Moses on the summit like everyone thinks, I didn’t get that feeling at all. Tourism has created the site into major sun worship. 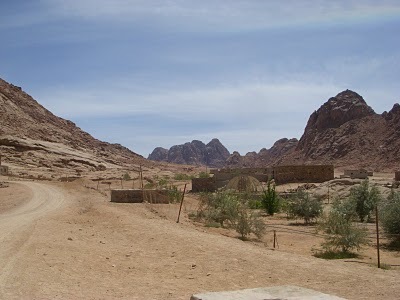 This lower picture is of Mount Sinai. To get this view a person has to take a taxi to this other Wadi, which the mountain can be viewed, although there is no way could over 600,000 people plus live-stock camp in this Wadi. This is the view of the side of the camel trail – the front side. Each person needs to decided for themselves what is true or false. Next post: Heading to Nuweiba.